A few years back I played a little Wii game called Cold Stone Creamery: Scoop It Up, and advertainment piece that involved assembling ice cream cones for random customers passing by a storefront. Thefty Jack's Zombie I Scream is pretty much the same thing. Well, except your customers are undead and somehow the U.S. government has figured out how to cure undeath via ice cream. Scoop up the right flavor combination and shambling corpses animated by dark magic or darker science suddenly have all of their limbs and skin and boy do they feel silly for trying to eat people. 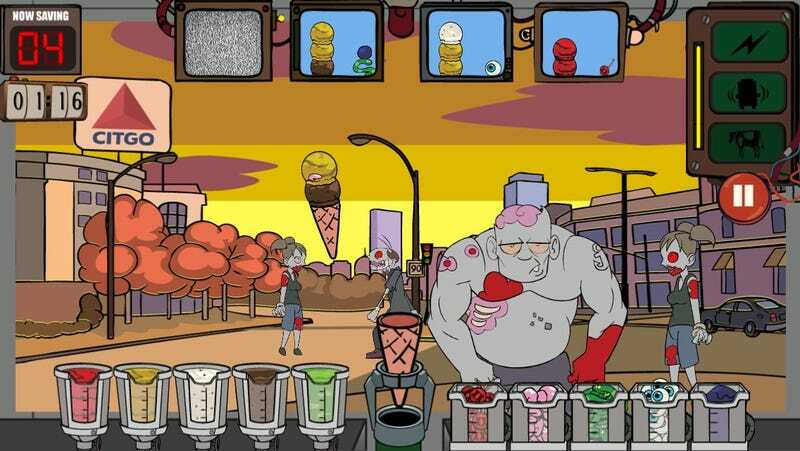 So it's an undead ice cream game—an undead ice cream game set in Boston, with 35 levels spread across locales like Fenway Park, Faneuil Hall and Harvard Square. How odd. Is it kid-friendly? Close enough, I say. The zombies are covered with blood and missing limbs in some cases, but there's no gratuitous gore and when you die (I am assuming death is involved) there's no splash of fresh blood on the screen—just an ending. Zombie I Scream is an excellent example of the weird things I play all day long since taking over mobile gaming duties for Kotaku. It's available on iTunes for $1.99, with an ad-supported lite version costing exactly $1.99 less than that.